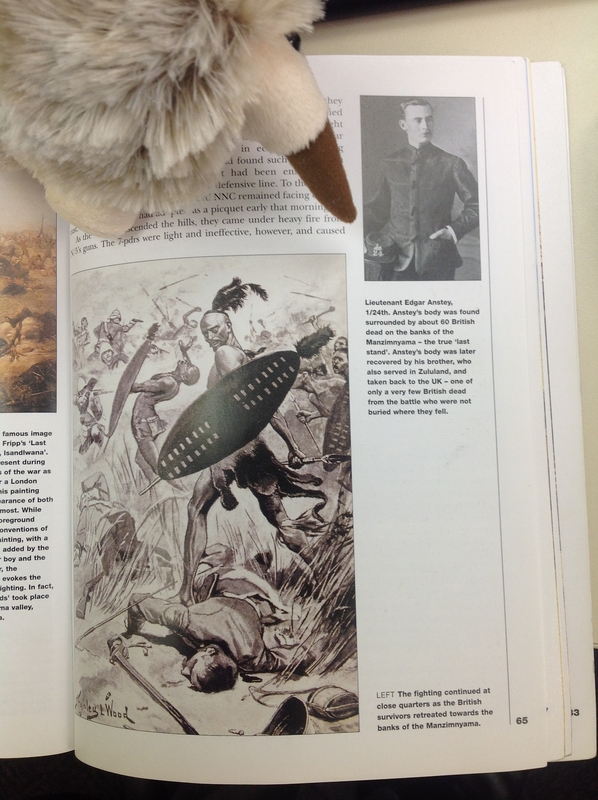 Anstey ponders the justness of the British invasion of Zululand while researching his namesake. The Local History office recently fielded a question by a member of the Tea Tree Gully and Districts Historical Society. The Society had been contacted by a person in England who had a question relating to the tombstone of a Lieutenant Edgar Oliphant Anstey, who had died during the 1879 Zulu War. The Lieutenant was listed as having been born at Highercombe, South Australia. I was able to confirm that Lt Edgar Anstey was the son of George Anstey, after whom both Anstey Hill and the Library’s mascot are named. Edgar was born in Highercombe in 1851. In 1873, he graduated from the Royal Military Academy at Sandhurst, and was commissioned a Lieutenant in the First Battalion, Twenty-fourth Regiment of Foot. Edgar was a part of a British invasion force that had set up camp in Zulu territory near the Isandlwana Mountain. On 22 January 1879 an army of 24,000 Zulus had moved, undetected, into striking distance of the camp and attacked. The ensuing battle saw the British out-maneuvered and outnumbered by the Zulus. Over 1300 British soldiers were killed. It was the greatest defeat suffered by the British Army in the Victorian era. Sources state that Edgar’s body was found by his brother, who was also serving in Zululand, and sent to England for burial. Edgar’s death gives him the sad distinction of being the first South Australian to die as a soldier on active duty overseas, the first of a number that would swell during the twentieth century. This entry was posted in local history and tagged Anstey, Boer War, Zulu by ttghistory. Bookmark the permalink.